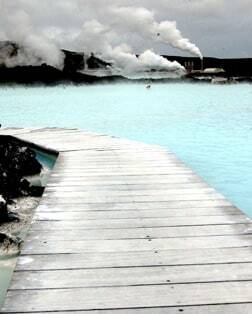 One of Iceland's hottest destinations, this stunning outdoor geothermal spa offers steamy mineral-rich water, a boon for the skin and certain skin conditions, that's fed by the excess underground water drawn by Svartsengi Geothermal Power Plant. Established in 1930 to protect an area of true historical, cultural and geological value, this remarkable national shrine features Iceland's largest natural lake and amazing views of the continental rift known as the Mid-Atlantic Ridge. The "Golden Waterfall," often complete with rainbows, wows as its rushing water tumbles down three natural, curving cascades then plunges down into a deep gorge to once again flow southward with the wide Hvítá River. With explosive eruptions every few minutes, this awe-inspiring geyser stuns as it hurls boiling water up to 60 feet skyward. Mud pools, algal deposits and stark terrain add to the drama at this geothermal hotspot. Iceland's second largest power plant, Nesjavellir, sits near active volcano Hengill and Thingvallavatn, Iceland's chief natural lake. Using nearby boreholes from 1947, this geothermal plant produces the nation's top high-temp field. Situated in the middle of the Mid-Atlantic Ridge's fissure zone, this famous geothermic field naturally produces steam vents, hot springs and super-heated mud pots whose sulfur deposits lead to a myriad of colorful crystal deposits. Spectacular in form and function, this 10-story geothermally heated masterpiece serves greater Reykjavik's water storage needs while thrilling visitors with mesmerizing panoramic views and a glass-domed restaurant that revolves. Nestled on Iceland's serene south coast, this idyllic fishing village charms with majestic vistas, a sparkling shoreline with excellent bird watching and the country's oldest preserved timber dwelling, a Norwegian kit home from 1765.